Carpenter bees can be highly destructive. If you discover an infestation, take swift action. Call an exterminator or continue reading to learn more about your DIY pest control options. Given enough time, carpenter bees can bring down an entire house. 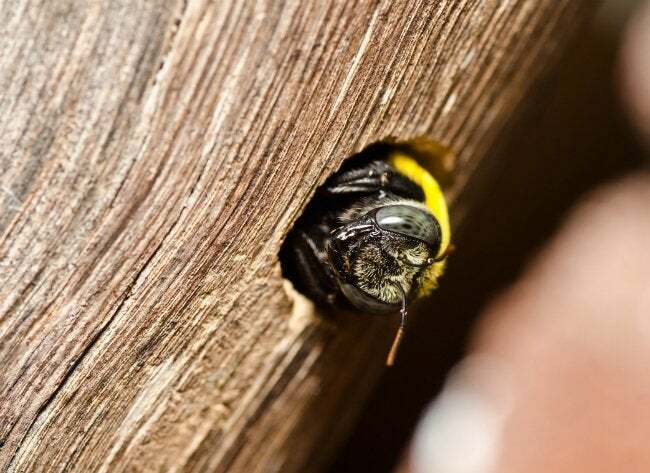 The good news: These bees prefer to nest in untreated wood. So long as any wood on the home exterior has been painted or coated with another finish, there’s little danger of problems arising. A variety of chemicals can be used to eliminate carpenter bees, but it’s best to check with your local extension service to find out which are the most effective treatments among the ones legal in your area. In many cases, the trick is to apply insecticidal dust to the entrance of the nest, so bees pick up the powder when coming or going. Once you see that bees have left the nest, wait a few days, then fill the nest entrance with wood filler or putty. Bear in mind that working at night minimizes your chances of being stung. Also note that you’ll get best results applying the insecticide in the spring (when adult bees emerge to mate) and late summer (when the next generation takes flight).